One of the most popular pastors in America, Pastor Rick Warren, is grieving with his family after his son took his own life on Friday. Warren's brother-in-law called for prayers for the family, and said Warren and his wife are facing the news together. NBC's Diana Alvear reports. The youngest son of Rick Warren, author of "The Purpose Driven Life," has committed suicide, the evangelical pastor said in a letter to members of his church on Saturday. Matthew Warren, the youngest son of Warren and his wife Kay, died after a long struggle with mental illness, according to the statement from Saddleback Valley Community Church in Lake Forest, Calif. The church asked for “everyone to join us in praying for the entire Warren family” on Saturday. 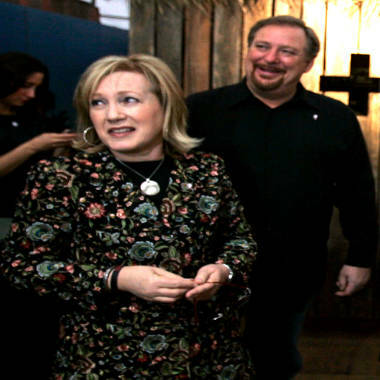 On his Facebook page Sunday, Rick Warren, said, "Kay and I are overwhelmed by your love, prayers, and kind words." Matthew Warren was found dead of what appeared to be suicide by gunshot in his home in Mission Viejo, Calif., said Supervising Deputy Dan Aikin of the Orange County Sheriff-Coroner’s Department. The estimated time of death was 10 a.m. on Friday morning. The sheriff’s department was called to the home at about 5:15 p.m., Aikin told NBC News. An autopsy is scheduled for Tuesday. Democratic presidential hopeful, Sen. Hillary Rodham Clinton, D-N.Y., talks with Kay and Rick Warren at Saddleback Church in Lake Forest, Calif., Thursday, Nov. 29, 2007. Warren delivered an invocation at President Barack Obama's first inauguration in January 2009. In 2008, the Saddleback church sponsored a presidential forum with Barack Obama and John McCain. Obama and Republican nominee Mitt Romney were invited to a similar forum last fall, but Warren canceled it several days beforehand, saying the campaign had become too uncivil. Pastor Rick Warren's son, 27, has committed suicide after struggling with mental illness for some time. Pastor Warren delivered the invocation at President Obama's 2008 inauguration. MSNBC's Craig Melvin reports.